A small bridge with a big history, located right on the border between (West) Berlin and Potsdam. It was not only part of the Iron Curtain all through the era of the Cold War and the division of Germany, but also served as a high-profile location for the exchange of spies between the Eastern Bloc and the West. A new museum at the site now chronicles this history. More background info: The present Glienicke Bridge is the last in a number of incarnations at the site. The comparatively plain steel construction dates back to 1907, when the waterway that it spans had to be opened for boat traffic, so that the previous low stone bridge (designed by famous architect Karl Friedrich Schinkel) had to go. This changed with the end of WWII. First the bridge was damaged during the Battle of Berlin, though only partially collapsed so that in 1947 it could be repaired. However, its location meant that it was right on the border between the American Sector of divided Berlin and the Soviet Occupation Zone around West Berlin, which later was to become the GDR – the East German authorities even had the nerve to rename it the Bridge of Unity, which was of course extremely cynical, given it became part of the symbol of the very opposite of unity, the Iron Curtain! Soon the bridge was closed for general traffic and could only be crossed with special permission. From 1953 it was completely closed off for the general civilian public and only authorized Allied military personnel were allowed to use the bridge. For all others it was a dead end – at least from the West Berlin side … on the GDR side people weren't even allowed to get close to it, except with a special pass. The Potsdam bridgehead was fortified with huge concrete roadblocks, machine gun posts and barriers, while the border either side of it became essentially part of the Berlin Wall. Remarkably, the villa right by the Potsdam bridgehead, the Villa Schöningen (originally a residential villa for Prussian royalty), continued to serve as a children's home throughout the GDR era – and that only yards from the sensitive border! But obviously this meant that the villa's residents were subject to special scrutiny. What made the Glienicke Bridge the stuff of legends is the fact that it was chosen by the opposing Cold War superpowers as the location for spectacular exchanges of spies. This even gave the bridge the epithet "Bridge of Spies" in popular culture –although it was only on three occasions that such exchanges took place. The first one was in 1962, involving US pilot (and CIA agent) Francis Gary Powers, who had been shot down in his U2 spy plane over the Soviet Union in 1960 and was finally released in exchange for top KGB spy Rudolf Abel who was handed back to the Soviet side ... he had been key in passing on secret details of the US atomic bomb programme to the USSR. The third and last exchange, also the one involving the largest number of persons, took place in 1986. Even though they were actually just three very exceptional historical moments, the footage of the tense situation of the simultaneous hand-overs, when opposing spies were driven to the white line that marked the official border line right in the middle of the bridge and then had to walk under the nervously watchful eyes of both sides to the opposite bridgehead, had all the drama of a James Bond movie. Hence the legend lives on. Shortly after the fall of the Berlin Wall, the border crossing point of Glienicke Bridge was opened too, the fortifications removed and the road reintegrated into unified Germany's infrastructure. Now it's just like any road bridge over Berlin's and Potsdam's many waterways. Given its legendary status, however, the bridge was always set to remain a (dark) tourist site. But it was only in 2009, 20 years after the fall of the Wall, that a museum was opened in the refurbished Villa Schöningen right next to the bridge. What there is to see: The bridge as such isn't all that spectacular. OK, it's prettier than many, but still it wouldn't be anything to write home about were it not for the history of this spot. Now that the bridge is open to traffic again, there's nothing on it that would remind you of what it looked like when it was a (mostly closed) border crossing point between the Eastern Bloc/GDR and the American Sector of West Berlin. In short; it's just a bridge – all historical associations are thus more or less down to your imagination only. To help this along a bit, however, there are at least a couple of information panels near the bridge. 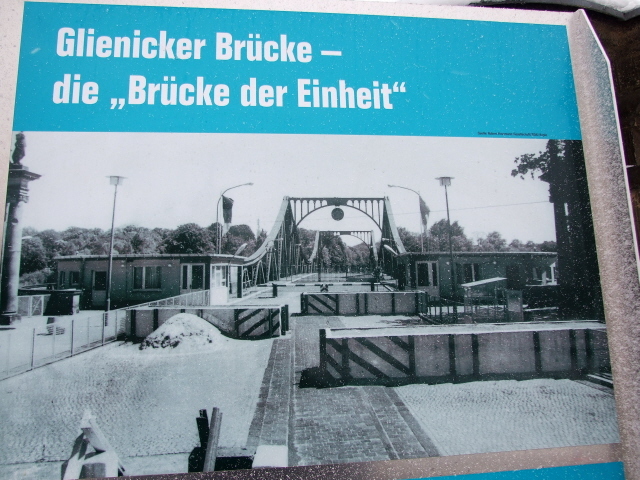 One on the eastern/Berlin side provides a short historical text in German and English as well as a few photos, including one that shows the extensive border fortifications at the GDR/Potsdam end of the bride. Near that end, today only a brown panel serves as a reminder that there once was a border dividing Germany and Europe at this spot. Next to the Potsdam end bridgehead there is now also a museum – in fact one of Berlin's newest, in the refurbished Villa Schöningen. A single section of Berlin Wall in front of the museum's entrance indicates what it's all about. In fact, the site is part of the "Berliner Mauerweg", the "Berlin Wall Trail" that now completely encircles what used to be West Berlin, even though hardly a trace of the actual Wall is left today. Most of it is just a cycle/hiking trail. Inside the museum, the permanent historical exhibition is a very sleek and modern affair, relying mostly on multi-media stations consisting of computer screens (of the well-known piece-of-fruit-with-a-bite-taken-out-of-it brand) mounted on walls with touch pads next to them for navigation. These provide information about the bridge's history, naturally with an emphasis on the Cold War era, with more info about the inner-German border in general. Unfortunately, for international visitors, all texts are in German only! At least that was the case when I visited in January 2010. Their website does now have English, so maybe they've added English at the exhibition too meanwhile. In addition to the computer screens there are various artefacts on display, including medals of GDR border guards, uniforms, a border guard's pistol, pieces of the border fence and even a piece of former border fortification that looks like a bed of nails! Basically that's what it was – positioned at especially sensitive spots e.g. to prevent people climbing over fences … or else they risked getting pierced by the 6 inch (15 cm) long spikes of so-called "Stalin grass". Scary stuff. One special section, in the form of a darkened cinema room, is set aside for the documentation of what the Glienicke Bridge is arguably most famous for: namely as the site of a few spectacular spy swaps between the Soviet Union and the USA. Another section features interviews on screens with key figures of the end of the Cold War and German reunification, such as Mikhail Gorbachev and former US president George Bush senior. Less prominent witnesses get their say throughout the exhibition as well, though. One star piece is a block of concrete from the Berlin Wall that is distinguished from the millions of other souvenir pieces like it by the fact that it was especially signed and presented by Gorbachev, Bush and Kohl on the occasion of the opening of the museum, which (cleverly) coincided with celebrations for the 20th anniversary of the fall of the Wall on 9 November 2009, when all these political celebrities of those days were present in Berlin. On your way out you will see that the section of Berlin Wall outside the entrance was also signed on the same occasion by hundreds more people. On a lighter note, the museum also has a café / bar and space for temporary exhibitions of modern art, preferably of the sort that deals with related issues of the former border in artistic ways. All in all, the place is well worth visiting – but only really if your German is up to scratch, otherwise you won't get all that much out of the exhibition (unless language provision at the museum has changed in the meantime). But seeing the actual bridge itself is certainly something for those of you who get a buzz out of standing at genuine spots of historical significance such as this. Location: at the furthest south-western end of Berlin, some 15 miles /23 km from the city centre (at Brandenburg Gate), and right on the border with Potsdam. Technically, the western end of the bridge as well as the museum are actually on Potsdam/Brandenburg territory. But because thematically it has a closer connection with Berlin it is subsumed under that city's heading here. Access and costs: far out, but reachable by (a long ride on) public transport; fairly pricey. Details: From the centre of Berlin it is a very long ride out indeed, but it is doable. First you'd want to get regional metro train to Wannsee station (either S1 from e.g. Potsdamer Platz or Brandenburger Tor, or S7 from e.g. Zoo Station, Hauptbahnhof or Alexanderplatz). From Wannsee station get the 316 bus all the way down to Glienicke Bridge's eastern West Berlin end (one stop before the terminus, called "Glienicker Lake"). If you cross the bridge you'd theoretically enter Potsdam and thus an extra tariff zone (C in addition to A and B). You could of course also make your way to the bridge from Potsdam, i.e. without even setting foot on Berlin territory. There's a tram, line 93, that goes from Potsdam's main station to its terminus near the Glienicke Bridge. If you have a three-zone ticket (ABC) for Berlin, which also covers Potsdam, then it might be even quicker to get the S7 all the way to Potsdam (three stops further on from Wannsee) and then proceed by tram. In any case, allow for long travel times (at least an hour, most likely more, depending on connections). The bridge itself is accessible freely at all times, of course, though during daylight hours makes most sense. Opening times of the exhibition in Villa Schöningen: Tuesday to Friday 11 a.m. to 6 p.m.; Saturday/Sunday from 10 a.m.; closed Mondays. Time required: The bridge itself only requires a few minutes; how long you'd need in the museum will crucially depend on how good your understanding of German is. If you're proficient enough, then something like an hour or so could be an adequate amount of time. If you don't know any German at all then you'd be out again in less than 10 minutes, I would guess – and thus you may not even want to bother going in at all. Combinations with other dark destinations: Given that the bridge is located on the furthest edge of Berlin, that city's other dark attractions are actually all further away from here than those of Potsdam on the other side of the bridge. In fact there is a signposted walking trail leading from the western end of the bridge all the way just over a mile (1.8 km) to Schloss Cecilienhof, site of the post-WWII Potsdam Conference of the Allied Powers. The closest dark site on Berlin territory is the House of the Wannsee Conference, north of the district of the same name and reached by bus 316 and then onwards by bus line 114 (or, if you feel up for it, you can walk the full 5 miles / 8 km or so through the park along the southern lake shores). Combinations with non-dark destinations: in general see Potsdam and Berlin. On the eastern side of the bridge, that is in West Berlin (if that's confusing, have a look at the map), is another Karl-Schinkel-designed piece of imperial architecture, the Glienicke Palace, set in an atmospheric park, ideal for a leisurely stroll. Further south is the older former Hunting Lodge also associated with Prussian royalty. There is also a landing stage next to this side of the bridge, from where pleasure boats depart for cruises on the nearby waterways around Potsdam and the Wannsee.